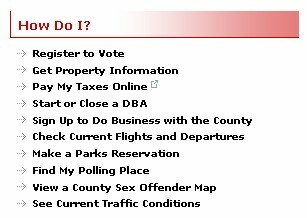 Help make your visit to the Monroe County website more enjoyable by familiarizing yourself with the following functionality. The Monroe County website can be navigated by a variety of tools and from multiple entry points. The intuitive design of the navigation allows data to be easily accessed from a variety of directions or portal pages. There are several category tabs (landing pages) in the primary website navigation. MyMonroe: The Home Page can be accessed from anywhere within the website. Resident: Overview of links and information of interest to Monroe County residents. Visitors: People visiting the area have an easy guide to services to make a stay easier. Government: Overview of Government services and information. Employment: Links to a variety of Employment subjects within Monroe County. Departments: Easy-to-browse Monroe County Department overview and links. Get It Done Online: This tool allows visitors to browse hundreds of Monroe County programs by category and with access links to the specifics. 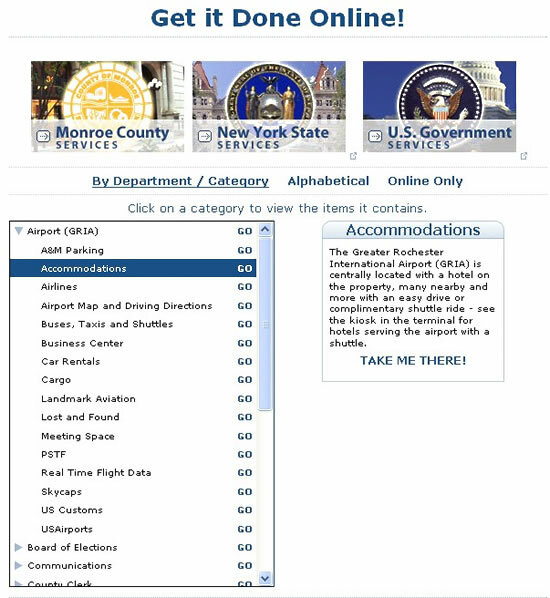 Monroe County departments can be viewed in a simple and easy-to-browse tool that can be opened or closed. In most cases when viewing a new page within the website it will be closed. Open the Department Navigation and click the plus sign and find quick links to Monroe County departments and agencies within the website. Close the Department Navigation by clicking the minus sign. Throughout the website there are jump links that will take the website browser to information both within the website and from a variety of outside sources or other websites. If the link goes to an outside website you will be notified that you are leaving the Monroe County website and going to an outside website. Links within the Monroe County website go directly to the page within the website. You will also find highlighted text within stories that are also direct links to related information. The Home Page of the Monroe County website feaures a Top Story News Ticker that will rotate automatically. You can control this rotation to view the 'Previous Story', Pause the Rotation, View the 'Next Story' and Read More about a story. Each one is easy to browse and search. Search information and services by Department, then Category and go to an overview—the "Take Me There" link will route you to the page with details.